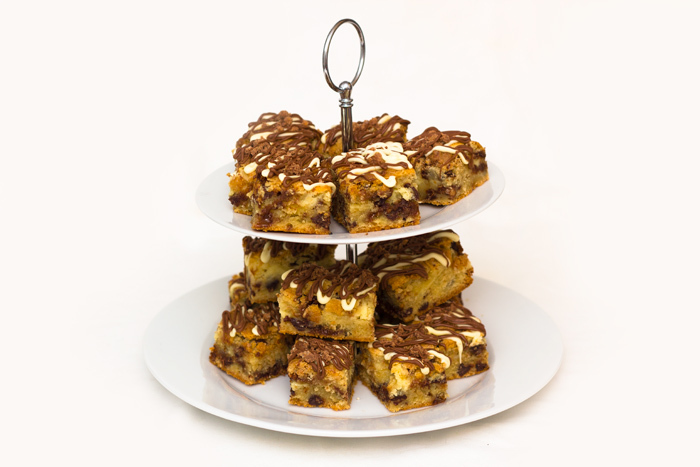 Toffee Crisp and Chocolate Chip Cheesecake Cookie Bars! 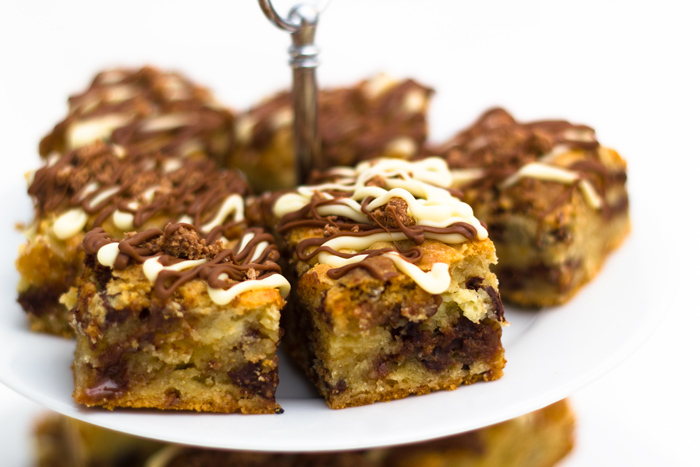 A layer of cheesecake sandwiched between cookie dough. And some chocolate chips and Toffee Crisp chunks thrown in for good measure! A perfect dessert for a BBQ! 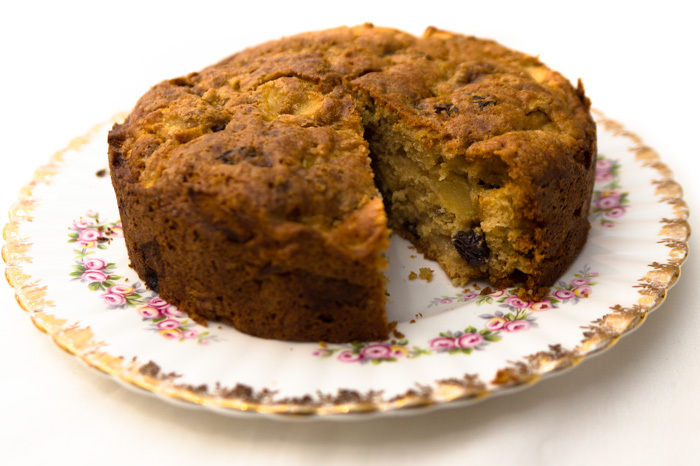 Today I’m going to share a recipe that I tried a while ago as I have been too busy to bake anything this weekend. The plan had been to do something yesterday morning but my husband decided to fit a new air box in his car and obviously this took longer than the experts said it would, and required a lot more of my help than I had anticipated so I didn’t have chance to get in the kitchen! The original recipe for these were for Oreo Chocolate chip cheesecake cookie bars but as I had recently made something else with Oreos I decided to mix it up a bit and go for Toffee Crisp cheesecake cookie bars! They were brilliant. Easy to eat and were even better the day after baking. They would be great to serve up after a BBQ! Refrigerate until completely chilled. Cut into 24 bars. Repeat with the dark chips. Drizzle over the bars and top with Toffee Crisp crumbs immediately. These are soooo good. Even my husband (who says he doesn’t like cheesecake) enjoyed a few of these! A great dessert to bring out at a garden party as you can just pick them up and eat them – no fuss, no mess! 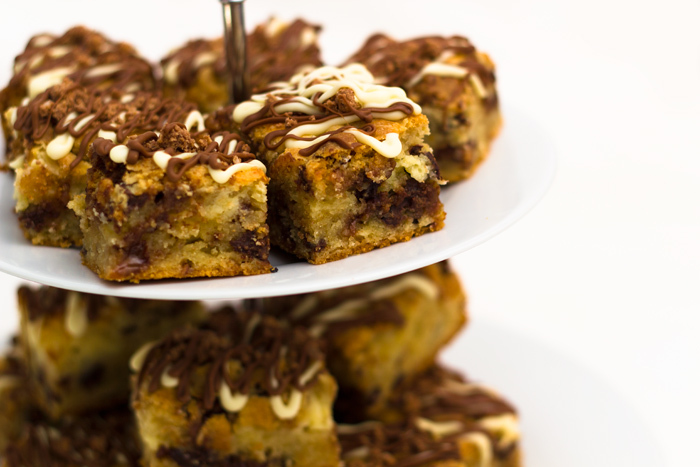 And of course, you can make them with any chocolate bar you wish! Or with crushed Oreo Cookies as the original recipe shows.